This stunning 2 level villa will fulfill all your holidays expectations and more! House has 2 master suites, and the spacious master on the second floor with king bed features huge balcony, overlooking the scented orange grooves-perfect place for morning coffee!Home has great bonuses, such as flat screen TVs and game room for family fun! Villa has amazing private pool and SPA, facing luscious gardens , cozy patio with furniture and char-coil grill. This house is located in majestic and high standard community of WestHaven. 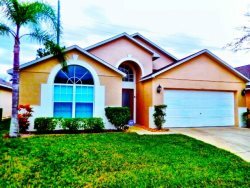 This subdivision is a magnificent place to stay here in Orlando and is definitely one of the most central locations when visiting any of the parks, Disney-Universal Studios and SeaWorld, because it is so close to the interstate. You are less than 2 miles away from the Interstate ramp and also less than 2 miles from five 18-hole golf courses and a huge shopping plaza with supermarkets and restaurants in the Champions Gate Golf Community.